A client at an alcohol treatment program stops to acknowledge his craving. A fibromyalgia patient savors a rosebush outside her window in the middle of a muscle spasm. Moments like these are integral to Mindfulness-Oriented Recovery Enhancement (MORE), an intervention that reduces substance use and other harmful behaviors by helping clients embrace life's pleasures and pains. MORE is the brainchild of Eric L. Garland, PhD, LCSW, associate dean for research and an associate professor at the University of Utah College of Social Work and author of Mindfulness-Oriented Recovery Enhancement for Addiction, Stress, and Pain (NASW Press 2013). The intervention combines three forms of therapy—mindfulness, cognitive behavioral therapy, and positive psychology—to curb addiction and help clients derive more satisfaction from nonharmful objects and experiences. The approach is a natural fit for social workers, Garland says, because it looks beyond preventing a relapse to helping clients rediscover their sense of meaning and purpose in everyday life. "One of the primary mechanisms that makes addiction progress and deepen is that as people become more and more addicted, they become less sensitive to natural pleasures," Garland says. "MORE teaches people to become aware of their positive experiences and to savor them so they can become an important source of well-being." MORE is currently offered in two formats led by master's-level social workers: a 10-week program addressing alcohol and illegal drug addiction and an eight-week program for prescription opioid misuse among chronic pain sufferers. Group leaders introduce the following three key techniques across the curriculum, each designed to help participants' brains place less and less value on drug-related triggers. 1. Mindfulness: Social workers begin MORE with lessons on mindful breathing, a technique that involves concentrating on the breath to increase focus and awareness in the present moment. Participants are then asked to apply mindfulness to experiences related to their substance use, such as pausing to explore how their body feels in the midst of a strong craving. This awareness helps participants better understand their habitual behaviors and patterns of thinking, Garland says, and to experience themselves as "much bigger than any one thought or craving." 2. Positive reappraisal: MORE then introduces positive reappraisal, an active coping strategy that helps clients reframe their negative thoughts by revisiting experiences from an alternative perspective. Take, for example, a group member who says he drinks to cope with a stressful job and the pressure of working for a "mean, hateful boss." The MORE facilitator might engage that person in a series of questions about the silver linings of a negative work environment. Subsequently, the client might come to view his supervisor's behavior as a symptom of his own workplace pressures rather than as a personal vendetta against his employees. This second phase borrows heavily from Albert Ellis' ABCDE model of cognitive therapy, Garland says, which states that people develop irrational beliefs stemming from an activating event or adversity. While these beliefs do lead to emotional and behavioral consequences, they can also be replaced by a new set of viewpoints. MORE introduces a short mindful breathing exercise before reappraisal to help clients reach a calmer state before challenging their ways of thinking (Garland, Gaylord, & Fredrickson, 2011). 3. Savoring: MORE's heart and soul arguably lies in mindful savoring, a technique that focuses on individual pleasures to train the brain to respond more strongly to natural stimuli. The practice stems from positive psychology's research on the impact of positive emotions, Garland says, including work done by his mentor and colleague Barbara Fredrickson. MORE facilitators invite group members to focus their attention on an item placed before them—for example, a bouquet of flowers—and to absorb the positive emotions they feel during that experience. Participants then complete savoring exercises at home to help them identify and extract rewards from their daily lives. Together, these techniques seek to restore balance between the brain's prefrontal cortical areas responsible for self-regulation and the subcortical areas dedicated to motivation, learning, and emotional response. The exact mechanism for this change remains unclear. Garland, however, has set his sights on the ventral striatum, a portion of the brain studied for its role in setting reward-induced behaviors (FitzGerald, Schwartenbeck, & Dolan, 2014). Garland attributes MORE's emphasis on rewiring clients' reward circuits to advances in neuroscience showing the adult brain is more malleable than originally believed. Working as a licensed psychotherapist has also motivated him to help clients think and act more intentionally. "I don't believe people are condemned by genetics or neurobiology. I think that all people, no matter where they start from, have the capacity to become stronger and to help themselves grow and change," Garland says. "The MORE intervention is grounded in that social work philosophy, part and parcel. It's embedded within every fiber." The initial research is encouraging. A 2014 clinical trial of 115 opioid-dependent chronic pain patients found that participants who completed MORE were less likely to misuse opioids and reported less desire for painkillers than those randomly assigned to a social support group. MORE patients also reported greater reductions in pain severity and less pain interference in daily life for up to three months after finishing the program (Garland, Manusov, Froeliger, Kelly, Williams, & Howard, 2014). Two follow-up studies (N=49 and N=29) revealed that participants who finished MORE were also more physiologically responsive to images of natural reward cues—a smiling baby or a couple holding hands, for example—as measured by their heart rate and brain activity. The more patients' physiological sensitivity increased, the less they reported craving opioids. As Garland and his colleagues later wrote: "These findings are perhaps the first in the scientific literature to support the notion that a behavioral intervention can restore natural reward processing in addiction" (Garland, Froeliger, & Howard, 2015). There are also many possibilities for adaptation. Garland and his research team recently examined MORE's impact on posttraumatic stress among patients diagnosed with co-occurring psychiatric and substance use disorders. Those findings are still awaiting publication. Additional studies are also in the works for topics including child maltreatment, Internet addiction, and weight loss among cancer survivors. Building the evidence base for MORE, Garland says, may ultimately give health care workers a multipurpose tool for addressing a number of symptoms tied to unhealthy behaviors. Patients, in turn, would undergo fewer medical tests and unnecessary procedures and embark on a more empowered path to physical, cognitive, and emotional healing. 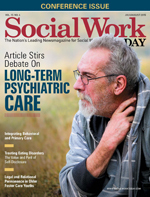 The field of social work would also benefit, as trained practitioners begin to fill new jobs and assume a more prominent, respected place in 21st century health care. Indeed, Garland says he views mind-body therapies such as MORE as a means for social workers to evolve beyond traditional case management to delivering evidence-based interventions. "My mission," he says, "is to put a social worker in every doctor's office in America." — Joelle Ruben, MSW, is a freelance writer based in Pennsylvania. FitzGerald, T. H. B., Schwartenbeck, P., & Dolan, R. J. (2014). Reward-related activity in ventral striatum is action contingent and modulated by behavioral relevance. The Journal of Neuroscience, 34(4), 1271-1279. Garland, E. L., Froeliger, B. E., & Howard, M. O. (2015). Neurophysiological evidence for remediation of reward processing deficits in chronic pain and opioid misuse following treatment with Mindfulness-Oriented Recovery Enhancement: Exploratory ERP findings from a pilot RCT. Journal of Behavioral Medicine, 38(2), 327-336. Garland, E. L., Gaylord, S. A., & Fredrickson, B. L. (2011). Positive reappraisal mediates the stress-reductive effects of mindfulness: An upward spiral process. Mindfulness, 2(1), 59-67. Garland, E. L., Manusov, E. G., Froeliger, B., Kelly, A., Williams, J. M., & Howard, M. O. (2014). Mindfulness-Oriented Recovery Enhancement for chronic pain and prescription opioid misuse: Results from an early-stage randomized control trial. Journal of Consulting and Clinical Psychology, 82(3), 448-459.